Brian and Angela Cartledge always wanted to be parents, but after struggling with infertility for years, the couple started to doubt that it would ever happen. Angela’s sister heard about embryo adoption at a baby shower, so the couple checked out Nightlight’s Snowflakes Embryo Adoption Program. 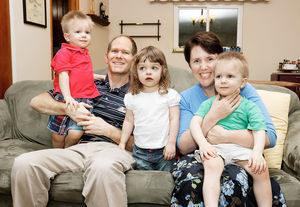 Now, the couple has triplets that will turn three in February.